Whether you're making a vegetarian or a non-vegetarian dumpling, a delicately flavored stuffing is what makes it a unique and fulfilling preparation. 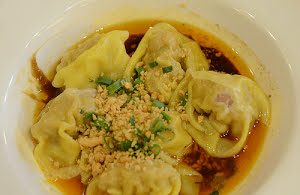 Dumplings are generally prepared in two ways. You can either cook them in boiling water or you can steam them. I prefer the latter option as the dumplings do not break and taste better when steamed correctly. Use fat-free lamb mince to get the best possible results. I always prefer to use readymade dumpling wrappers to save time. If you prefer, you can also use homemade wrappers. Feel free to moderate the flavoring ingredients as per your taste. Let's make these delicious, hot, and irresistible lamb dumplings in our kitchen. So, here we go! Savor these satisfying, spicy, and delicious lamb dumplings stuffed with richly seasoned lamb mince and served dipped in flavorful and infused chili oil. Take a large mixing bowl and add minced lamb, Shaoxing rice wine, dark soy sauce, light soy sauce, minced ginger, red chili flakes, Sichuan pepper powder, and salt in it. In a nonstick skillet, heat peanut oil on a low flame. Add minced scallion and stir fry for about 4 minutes. Transfer the scallion to the mixing bowl. Combine everything well with a large spatula and make sure all the ingredients are evenly mixed with each other. Take a dumpling wrapper and place 3/4 tsp of lamb mince stuffing in the center. Apply water on the edges of the wrapper and seal it gently with your fingers folding it in your preferred shape. Repeat the process for all the wrappers. Place a batch of raw dumplings in a single layer in a bamboo steamer. Bring water to a boil in a steaming pot and place covered bamboo steamer in it. Pour enough combined Sichuan chili oil & herb infused olive oil in a serving bowl such that the dumplings remain almost half-dipped in it. Gently place enough dumplings in the serving bowl. Garnish with chopped spring onion leaves and ground roasted peanuts.